A customer & shop favorite: Our VANOS 14mm to 12mm Conversion Banjo Bolt is designed to allow easy installation of the VANOS line on the M50/M52/S50us/S52us/M52tu/M54tu to the Euro S52/S54 Oil Filter Housing. 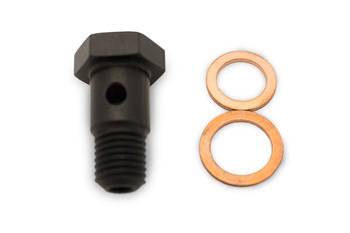 The unique design is made to fit the 14mm Banjo fitting on the factory line and also use the 14mm crush washer, this then screws right into the 12mm thread of the S50 Euro/S54 Oil Filter Housing. This will save you a lot of time and money in modifying the housing, especially if everything is bolted on already and your not comfortable drilling the expensive housing. From Anonymous of United Kingdom on 4/26/2017 . From Jeners Nieves of Puerto Rico, Puerto Rico on 2/14/2014 .